Just five games are on tap for tonight in the NHL but those matchups feature some of the brilliant young stars around the league. The Colorado Avalanche kick things off when they travel to see Matt Duchene and the Ottawa Senators in a chance to get back moving in the right direction. Colorado beat the Toronto Maple Leafs on Monday to record just their second win in the last ten games, far from a dominant stretch for a team expecting to be in the playoffs this season. As the Avalanche and other teams prepare for tonight’s action, we’ll keep track of all the minor moves around the league. The Winnipeg Jets have recalled Cameron Schilling from the minor leagues, an insurance policy with Ben Chiarot dealing with a minor injury. Schilling played four games with the Jets earlier this season, his first NHL action since 2014-15. After six games with the Dallas Stars, Erik Condra is heading back to the AHL. Condra was reassigned today after registering just one point in those six games. The 32-year old veteran is one of the Texas Stars’ best players and leads the club with 35 points in just 32 games. Karl Alzner was sent back to the minor leagues late last night, something the Montreal Canadiens can still do without putting him through waivers again. The Canadiens don’t play again until Friday and can save a substantial amount of cap space with each day Alzner spends in the minor leagues, though he is expected to travel with the team tomorrow when they head to Columbus. Despite still being off for the holiday, the Montreal Canadiens have announced an interesting roster move. The team has recalled veteran defenseman Karl Alzner from the minor leagues while moving David Schlemko to injured reserve. Alzner will join the team at practice tomorrow. It’s been a month since Alzner was placed on waivers and then eventually demoted by the Canadiens, after finding himself in the press box as a healthy scratch several times. The 30-year old defenseman ended up playing ten games in the AHL, his first in the minor leagues since 2009-10. In fact Alzner hadn’t even missed a regular season NHL game in more than eight seasons before sitting out the Canadiens opener, a move that showed the league that Montreal wasn’t ready to be a rebuilding doormat this season. The team was expected to struggle after trading captain Max Pacioretty for futures, but have instead shown they can still compete in the tough Atlantic Division and it is in no small part to giving their younger players more responsibility. While Alzner will be rejoining the team, it’s not clear if he’ll immediately go into the lineup for head coach Claude Julien. After signing a five-year, $23.125MM contract in 2017 it was quickly apparent that the former Washington Capitals defenseman would not be able to hold down a top pairing role and was more effective lower down in the lineup. Now with a bit of a wake-up call in the minor leagues, perhaps he will return with determined effort to carve out a role with the NHL club. At 19-13-5 and currently holding down the second wild card position, the Canadiens can’t be handing out second or third chances without expecting immediate results. When the Montreal Canadiens placed Karl Alzner on waivers this week there was little chance that he would be claimed. With a hefty contract that carries a $4.625MM cap hit—or $3.6MM when buried in the minors—through the 2021-22 season, it’s hard to imagine anyone picking up the tab and taking him off the Canadiens hands. In fact, his demotion to the minor leagues threatened the future of his NHL career given that Montreal had obviously moved on with younger, cheaper options on the blue line. Now, as if knowing that he has little chance of climbing back up to the top league, Alzner and his representation have been given permission to speak to other teams and seek a trade according to Pierre LeBrun on the latest edition of Insider Trading for TSN. There is obviously always the chance that the Canadiens themselves find a need for Alzner, should injury or inconsistency plague their current group. The team doesn’t desperately need the cap discount they receive by keeping the 30-year old defenseman in the minor leagues, but does have a back log of players who are all eligible for waivers and would likely run the risk of getting claimed. That’s why Alzner was the odd man out in the first place, and why finding a trade partner isn’t necessarily a top priority for GM Marc Bergevin. Why not keep a veteran option in the minor leagues while you develop the rest of your group? Still, it’s easy to understand why Alzner would want out. The former Washington Capitals defenseman reached unrestricted free agency in 2017 and signed a five-year deal with the Canadiens, only to watch his friends and teammates go on to win the Stanley Cup without him. He’d been with that group for nearly a decade, and hadn’t missed a single game since becoming a full-time NHL player in 2010. 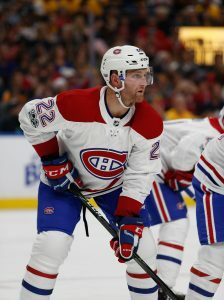 After suiting up for all 82 games in his first season with Montreal, Alzner was a healthy scratch on opening night this year and played just eight games with the Canadiens before hitting waivers. It’s hard for any NHL player to accept an assignment to the minor leagues, but for one who hadn’t even missed a game in years the demotion is likely even tougher. Alzner obviously wants to play still, but any deal will likely have to include salary coming back to the Canadiens to even things out. Those deals are always the toughest to make, meaning his NHL future may still be extremely limited. Tuesday: Alzner has cleared waivers as expected, and is on his way to the minor leagues. Monday: The Montreal Canadiens had to make a decision about their defense corps as they prepare to welcome captain Shea Weber back, but it wasn’t going to be easy. Today, they have placed Karl Alzner on waivers with the intent of sending him to the minor leagues. Alzner is not at practice with the Canadiens today, and will almost certainly clear waivers thanks to his hefty contract. Alzner, 30, is less than two years removed from signing one of the largest contracts of the 2017 offseason, a five-year $23.125MM deal with the intent of him shoring up the Montreal blue line. The former Washington Capitals player was meant to be another physical, veteran presence alongside Weber and allow the team to develop their young defensemen slowly. Unfortunately, Alzner’s game took a quick and decisive downward turn and he started this season in head coach Claude Julien’s dog house. Scratched on opening night and several more since then, Alzner has played just eight games this season despite previously playing all 82 games (or 48 in the case of the lockout-shortened 2012-13 season) in his previous eight years. Suddenly, not only does Alzner look like he’s headed for the minors but his NHL career could potentially be over. With a $4.625MM cap hit he would have to substantially improve his play to be appealing to any team in the league, and with three more seasons still left on his contract after this year he’ll be 34 before he could be back up with a lower cost. That is, unless the Canadiens buy out his contract at the end of the year. Unfortunately, that buyout option doesn’t look very appealing at the moment. While the Canadiens would get more than $3.5MM in cap savings for the 2019-20 season, that benefit wouldn’t last because of the structure of Alzner’s deal. In fact, in 2020-21 they’d still have to carry a $4.2MM cap hit because of his low base salary. That’s more than the $3.6MM cap hit he’ll cause by playing in the minor leagues. Alzner also has a seven team no-trade clause, if the Canadiens hope to move him somewhere else for some cap relief. Remember though, Alzner’s cap is not dead money like a player who has suffered a career-ending injury. With him healthy, the team still owes him his full $6MM salary this season, and though that decreases in the future, a team like Arizona who has been known to take on injured contracts in the past likely wouldn’t have much interest. There’s no insurance paying Alzner’s deal, meaning he’ll be a very expensive minor league asset for Montreal going forward. The Montreal Canadiens are coming off another loss, this time at the hands of the New Jersey Devils who scored five goals in the first two periods. Montreal now sits fifth in the Atlantic Division with 26 points and a -3 goal differential. That’s not very impressive, but it does at least keep them in the playoff race as they await the return of their captain. Shea Weber is ahead of schedule and could be back on the ice before long, which while obviously good news also likely means the end of someone else’s tenure on the NHL roster. That’s what Eric Engels details in his latest for Sportsnet, breaking down the various options that the Canadiens have to make room for Weber. The most startling of these options may be the idea that the Canadiens could waive Karl Alzner, less than 18 months after signing him to a five-year contract worth more than $23MM. The team has already sat the veteran defenseman in the press box for most of the season, getting him into just six games over their first 22. Importantly though, Elliotte Friedman of Sportsnet adds in his latest 31 Thoughts column that the Canadiens have been looking to trade a defenseman instead of risking them on waivers. In Alzner’s case it doesn’t seem like much of a risk given his high salary, but for some of the others—Jordie Benn, David Schlemko and Xavier Ouellet are mentioned as trade options in Engels’ piece—there would certainly be teams willing to take a shot. Montreal is not in a place to be giving away assets for free, given their current balancing act on the line between competitiveness and concern. The team has played well this season to say in the mix and has some promising chemistry forming up front between Max Domi and Jonathan Drouin. Still, even with the emergence of Jesperi Kotkaniemi the team is lacking real impact prospects and could need to try and retool over the next few seasons. So a trade, given the circumstances, seems the most beneficial option. Whether that will come to pass is still to be seen, especially given the fact that the rest of the league can see the situation that GM Marc Bergevin is in. Noah Juulsen’s injury may buy him a bit more time, but at some point something will have to happen on the Montreal blue line. Defense-needy teams will be watching closely.